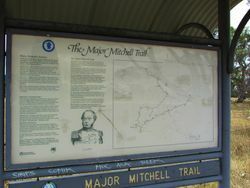 A cairn erected to commemorate the exploration of Major Thomas Mitchell in 1836. This cairn was erected marking the homeward route. Sir Thomas Livingstone Mitchell (1792 – 1855), surveyor and explorer of south-eastern Australia , was born at Grangemouth in Stirlingshire, Scotland. In 1827 he took up an appointment as Assistant Surveyor General of New South Wales. The following year he became Surveyor General and remained in this position until his death. Mitchell was knighted in 1839 for his contribution to the surveying of Australia. On his third expedition in 1836, Mitchell travelled to where the Lachlan, Murrumbidgee and Darling Rivers joined the Murray River in what is now Victoria. He mapped the western part of Victoria and named the Grampian Mountains, on the other side of which he found rich grazing land. The expedition travelled south west, and crossed mountains and rivers that no white people had ever seen. They reached the Glenelg River and rowed down to the sea at Portland Bay. Here Mitchell was surprised to find the Henty brothers and a thriving community that had been settled there since 1834. Representatives of the Ararat Shire and Borough Councils and the Ripon Shire Council at a conference here discussed the proposal to commemorate the passing of Major Mitchell, the explorer through this district in 1836. 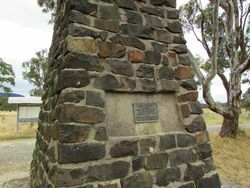 It was decided to join in erecting a cairn about 16ft high near Buangor, at a point where Major Mitchell’s track crossed the Western Highway, and also to place a memorial tablet on the cairn at the summit of Mount William, in the Grampians which the explorer climbed during his 1836 journey. The Argus (Melbourne), 3 October 1929. Middle Creek, Sunday - Another erection on the path of Sir Thomas Mitchell`s exploration of 1836 was unveiled in the Western District yesterday was unveiled by Sir James Barrett, president of the Historical Memorials Committee. 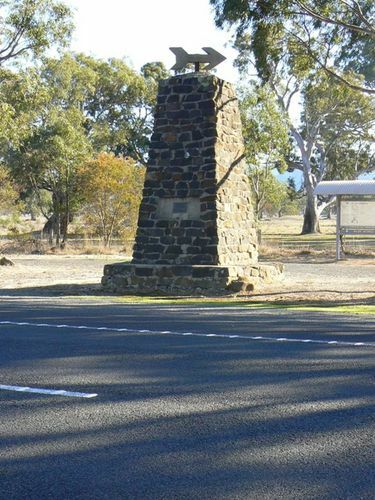 The memorial which was erected by the Shire of Ripon and Ararat and the borough of Ararat stands in a conspicuous position on the side of the Princes Highway, within a short distance of Middle Creek. Argus (Melbourne), 31 March 1930. At the unveiling of the Bulla memorial for Hume and Hovell, Charles Daley the Secretary of the Victorian Historical Society suggested that the idea be extended to to other explorers and a committee was formed to mark out the routes of Charles Sturt, Thomas Mitchell, Angus McMillan, and Count Paul de Strzelecki.